This is an example of a meditation built around Ets Chayim, using the Jewish prayer liturgy from the Siddur. It takes the person praying from Assiah, up through the levels to Atzilut. 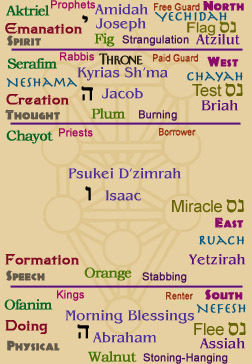 The prayers are drawn from many sources including Torah (Bible); the "Psukei D'zimrah" for example, are the last five Psalms. 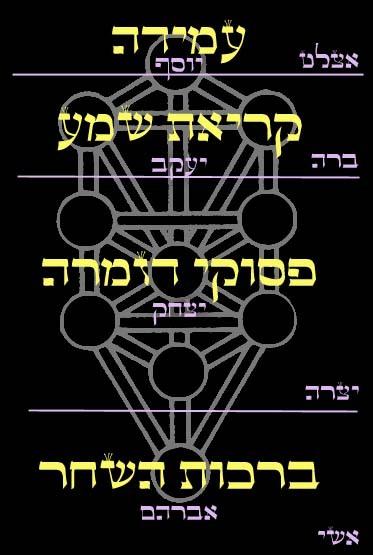 The Hebrew in the top chart is translated in the chart below. Those familiar with the prayers will understand this better, but any tradition can be adapted to the Tree of Life.